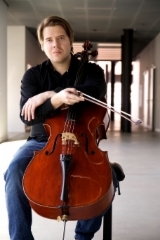 Markus Hallikainen (1987) is a versatile Finnish, Swiss based Cellist. He is currently studying in Soloist Diploma degree with prof. Raphael Wallfisch in Zürcher Hoschule der Künste. 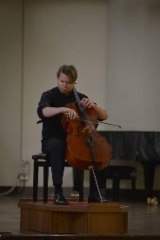 Markus started cello playing as a private student at the age of 5 with Helli Seppä. From 1997 he studied in Espoo Music Institute and from 2002 on in Sibelius-Academy Junior Departement, with Hannu Kiiski. He finished his Bachelor Degree under guidance of prof. Arto Noras and continued studying in Master degree with prof. Martti Rousi. Markus has performed as a soloist with Turku Philharmonic and Kuopio City Orchestra and also with many student/amateur orchestras. 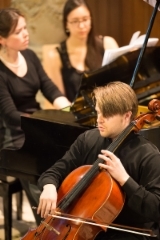 He has attended in following festivals as a soloist and chamber musician: Santander Festival, Santa Fe Chamber Music Festival, Apeldoorn Chamber Music Festival, Aurora Festival, Naantali Music Festival, Amsterdam Cello Bienale and many other smaller festivals in Finland, Norway, Italy and Russia. Markus has had a priviledge to share stage with Arto Noras, Frans Helmersson, Massimo Quarta, Avedis Kouvoudjiam, Ivan Monighetti, Wolfgang Klos, Zachar Bron, Sakari Oramo,Peter Csaba, Alexei Orgrintchouk, Robert Lehrbaumer, Martti Rousi, Kaija Saarikettu, Anu and Pia Komsi and Claudio Martinez Mehner. 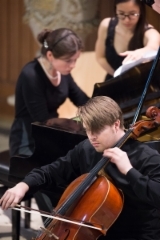 He has also worked as a Principal Cellist in Vaasa City Orchestra (Finland) and an Assistant Principal Cellist in Turku Philharmonic. 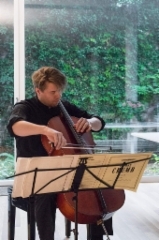 Markus has attended cello masterclasses of Antonio Meneses, Ivan Monighetti, David Geringas, Frans Helmersson, Tsuyoshi Tsutsumi, Robert Cohen, Marko Ylönen and Michel Strauss. He has also studied chamber music in Finland with Paavo Pohjola, Martti Rautio and in many masterclasses with members of Juilliard Quartet, Kopelman Quartet, Oslo String Quartet, Auer Quartet. Also with Phillip Graffin, Edouard Brunner, Tim Summers. Ulrich Koella and Eckart Heiligers. Markus is very active in other areas of classical music also. 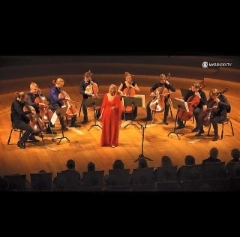 He gave his Debut in modern music festival ”Time of Music” in Finland 2014. During same year, he gave the Premiere of Piano Trio by Fredrik LeBel in Apeldoorn Festival. He has given first performamces of numerous works and co-operated with young composers. Besides Finland, in Switzerland, Austria and United States. He has also studied contemporary music with Kaija Saariaho, Magnus Lindberg and Anssi Karttunen. In addition, Markus has studied barockcello and barock chamber music in Zurich with Valeria Jegorova Robinson and Martin Zeller. 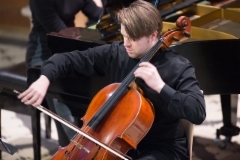 Markus plays on a exceptionally fine french cello 1870 by Just Derazey. His exquisite bow made by Victor Fetique is funded by Finnish Cultural Foundation and Wihuri Foundation.